Choosing bed sizes that is right for your situation is an important decision that can effect your comfort and quality of sleep. Mattress shopping can be a daunting task but knowing what you want before you go makes all the difference. Knowing the different bed sizes that are out there and how they will fit into your space will make the shopping faster, easier, and a lot less frustrating. 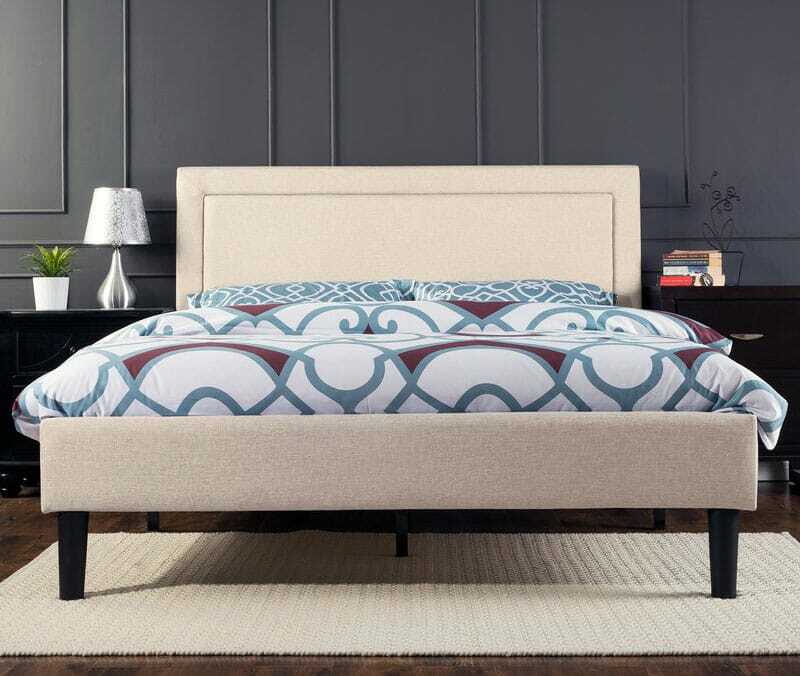 Below we’ll cover the most popular bed sizes as well as provide some interior designer tips to help you choose the best mattress size for you. Here are some handy dimensions to keep in mind, you can use these dimensions and some painters tape that won’t damage your floor to make a quick outline of the bed so you can get an idea of how much room in will take up in your space. Keep in mind that this is your mattress size, the bed frame that you chose may add extra length and width. For more help with choosing bed sizes take a look at our guide of bedroom layout ideas for easier room planning. 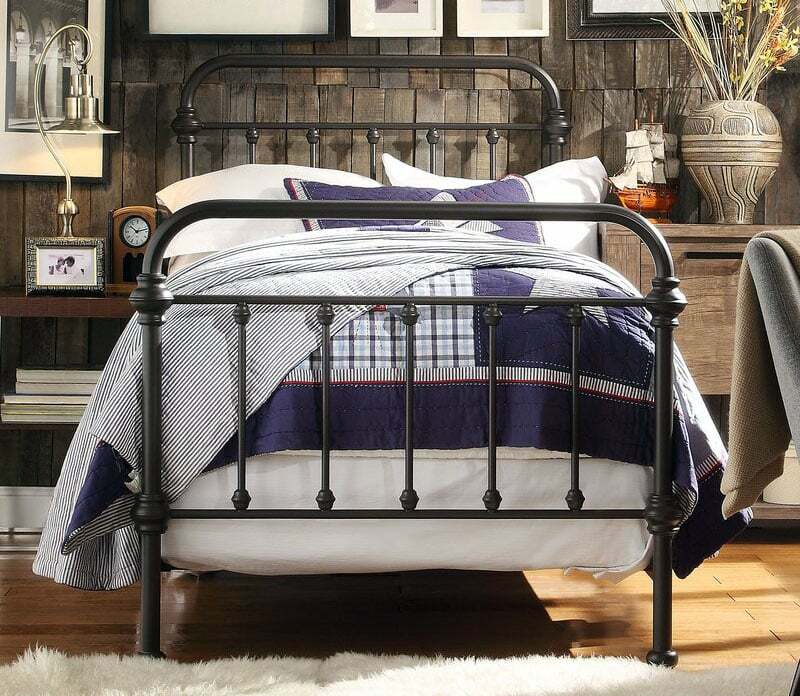 In addition we have gallery featuring the most popular types of beds available. Standard King-sized beds in the United States and Canada are 76in by 80in, measured in cm, a king-sized mattress is 193cm by 203cm. If your mattress needs box springs, you may use either one king-sized box spring or two twin xl box springs, for ease of portability. A king-sized bed might fit in your empty room, but once you add a bedside table or two, a dresser, and other furnishings, that king-sized bed might be too big. Remember when choosing bed sizes to consider the measurements of all of your furnishings when determining whether or not the mattress and bed frame will fit in the space. 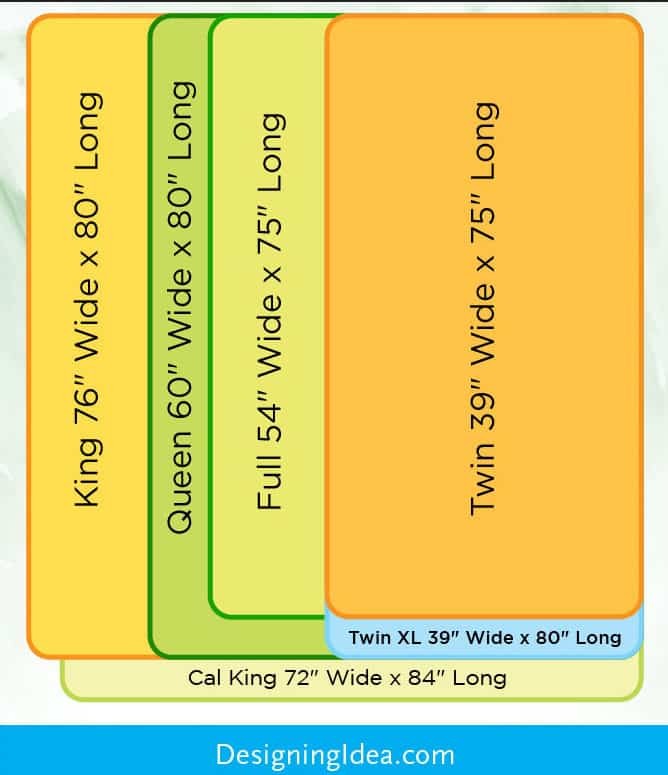 California King beds are 72in by 84in or 183cm by 213cm, making them a bit narrower and longer than a standard king. Remember, some sizes of bed are difficult to find bed linens for, look for bed linens in each size to ensure that you can easily find linens with will fit the bed, your style, and your budget before you make an investment in your mattress. A lot of newly constructed homes these days have master suites that feel like caverns, a large bed is a great way to fill that space and make it more like a home than an echo chamber. You want to leave about 2’ of space around the sides and foot of your bed so that you have ample room to move about the space. If you have a narrower room but still want a large bed, the California King is worth looking into. Is everything really bigger in Texas? I’m not really sure, but a Texas King size bed, also known as Athletic King, is 80in by 98in or 203cm by 249cm, sure makes that statement ring true. Is it a bed or a trampoline? Whether you are using it for gymnastics or sleeping, you may need to get a frame custom-made for this beast, so plan accordingly if you are looking to go Texas big. The biggest bed size is the Alaskan King, measuring a whopping 9ft by 9ft, or 108in by 108in. You need a three-piece box spring to go with this room-sized bed. You could bed-share with a toddler never have a foot in your back at 3 a.m. with a bed this size! Of course, it is heavy and cumbersome so flipping and cleaning your mattress would require a team of strong friends. I’m sure they wouldn’t mind as long as you let them Netflix and chill with a pizza a few choice drinks afterwards. This is the ultimate slumber party bed! What if you prefer things a little more…queenly? Queen size bed dimensions are 60in by 80in or 152cm by 203cm. The queen sized mattress is currently the most popular mattress size and provides an ample amount of room for individuals and an acceptable amount of room for couples. 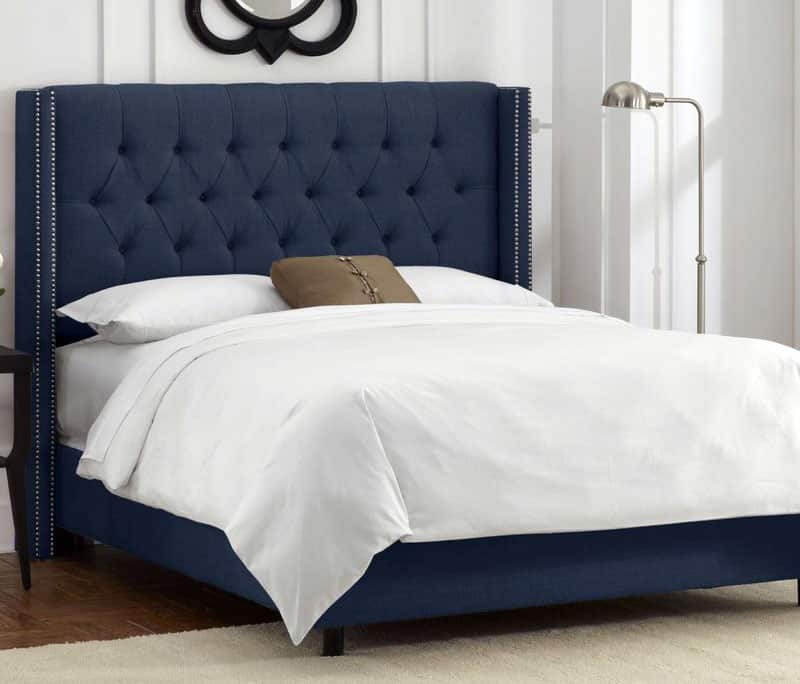 Two other variations of the queen sized bed are the Olympic and California Queen models. The Olympic queen bed measures 66″ by 80″, while the California queen bed measures 60″ by 84″. These two types provide a little extra length either to the width or length for those who need a little more space. You may ask yourself, well how much bigger is a king bed than a queen? A king is 16in wider than a queen but both are 80in long, making them the same length. What does this mean, exactly? Two people sleeping in a king-sized bed would each have about the space of a twin bed. In a queen, you each have the size of a small single in which to sleep. It fully depends on the size of your room and your sleeping preferences, if you like to stretch a bit and your partner doesn’t appreciate your hand in their face all night, that 16 inches could make a huge impact in the quality of your relationship and sleep experience. Of course, if you are the cuddly type, a queen bed could seal the deal for all sorts of romantic closeness. If you are a couple who really love cuddling and don’t mind your arms going numb under the weight of another person, then a full-size bed is your friend. Full size bed dimensions are 54in by 75in or 137cm by 191cm. Some would say that a full-size bed is perfect for a guest room. A good quality, comfortable full-size mattress tells your in-laws that you care, but sharing a smaller space won’t leave them tempted to extend their stay. Take it from an expert in the fine art of southern hospitality, kill them with kindness and save your sanity at the same time, make people comfortable in your home but not enough to move in! If you are a single person in your 30’s and are ready to graduate from your twin-sized college bed but don’t have a large apartment, a full-sized bed is a great option. And now we come to the size of twin beds. The dimensions of a twin bed are 38in by 75in or 97cm by 191cm. The terms twin bed and single bed can be used interchangeably. If you are not a child or are a bit on the tall side, a twin XL, which measures 39in by 80in is right for you. The twin XL is known, and maybe even loved, by many a dorm-dwelling college kids. Twin bed are great because they are compact enough to go vertical, as in bunk beds, saving floor space and creating that coveted top bunk for whichever kid wins paper, scissors, rock. Before deciding whether or not you want a pillowtop or memory foam, determine the correct size mattress for your space and your needs. Remember to leave about 2 feet around 3 sides of the bed to allow for comfortable movement in the room. That being said, there are plenty of ways to determine bed placement in a space, some of which break that rule successfully, so explore your space. Make a scale drawing and cut out templates of beds and your other furnishings and move them around the drawing. Again, use painters tape on the floor in the dimensions of the bed you want and walk around it, making sure that you have enough room to be comfortable. No one wants to constantly bash their shin into the bed frame because the space is too narrow to walk through. When choosing bed sizes it also pays to remember that your bed frame will add to the actual size as well as to the visual space that your bed takes up. Having a king size bed in a smaller room then adding in a solid oak 4 poster bed complete with oversized headboard and foot-board will feel dark and claustrophobic. Especially if you add other dark, heavy pieces of furniture. A Captains bed frame in bright white can house a twin sized mattress and provide extra storage in bedroom that might share space with a craft room. Great design requires us to consider not just how things look, but how things fit and function in a space. Determining the correct bed size is the start of great bedroom design. Knowing the mattress dimensions that you need before you shop will save you a lot of time and frustration pave the way for a relaxing bedroom that looks like it was designed by a pro.